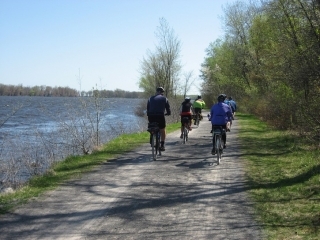 From the downtown area, cyclists can pick up a bicycle path by following Sussex eastward towards the Sir George-Étienne Cartier Parkway (formerly the Rockcliffe Parkway). You will eventually find a good paved bicycle path on the right side of the street. 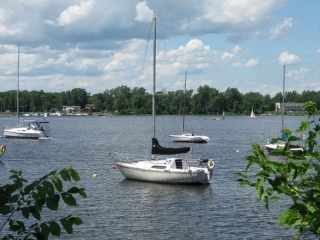 It starts in the vicinity of Rideau Hall (the Governor General’s residence). 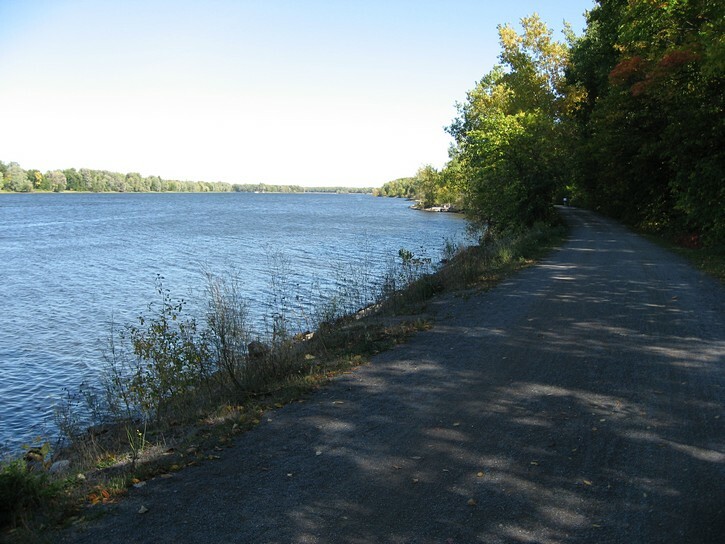 It only runs for a little over a kilometre, at which point it will deposit you back on the Sir George-Étienne Cartier Parkway. 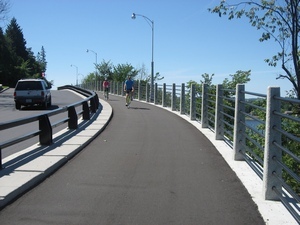 Although the Parkway can have quite a bit of traffic, you only have to ride on it for a few hundred metres before you are able to get on a relatively new pathway that was only completed in 2013. This path runs along the north side of the parkway and is truly superb. Since this whole area is located on higher land, the pathway offers a great view of the Ottawa River. 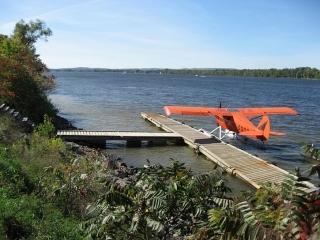 After about a kilometre the pathway passes by the entrance for the Ottawa New Edinburgh Club, and connects with the older Aviation Pathway. This is your standard paved path with the yellow line down the middle, and it continues eastward for several kilometres and ends a little past the Aviation Museum (the Rockcliffe Airport). For the most part, the Aviation Pathway parallels the Sir George-Étienne Cartier Parkway, and although it is pleasant enough, there is nothing very special about it. A far better option is to take one of several side paths down a short hill that leads to the Ottawa River. Here you will find a wide crushed stone pathway that is only a few feet from the water. 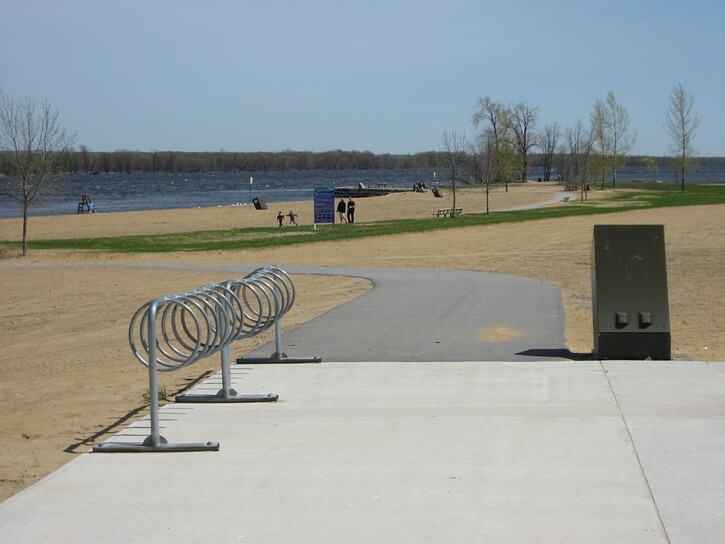 The crushed stone surface is easy to ride and suitable for all types of bikes. 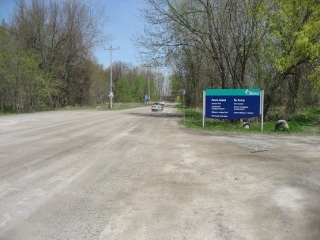 This crushed stone path starts just before the New Edinburgh Club and continues east for approximately nine kilometres. The path runs on a relatively narrow strip of land between a wooded hillside and the Ottawa River. 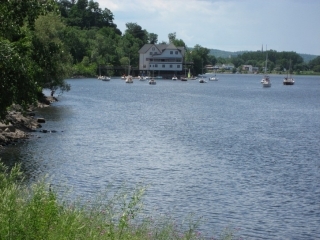 At one point the path runs through the middle of the Rockcliffe Yacht Club. In the river there are a series of uninhabited islands. This means there are several stretches where there are no structures or built up areas that are visible from the path, so it is easy to imagine that you’re cycling in the wilderness in Northern Ontario. Moreover, there are a number of areas where this path is shaded from the afternoon sun. All this makes for one of the nicer pathways in the Ottawa area. Further east, the crushed stone path heads inland and gradually loops back towards downtown Ottawa. 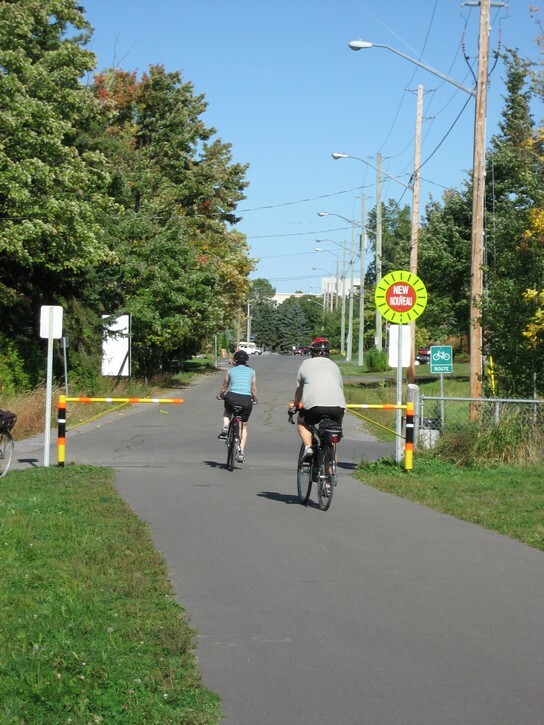 After about half a kilometre, it comes to a T-intersection with a paved pathway. Here you’ll turn left and go up a small hill. 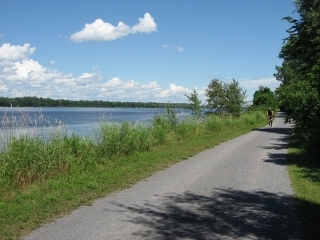 This will put you on a paved path which parallels the George-Étienne Cartier Parkway, and later the Ottawa River, and continues east for another 4 or 5 kilometres. The paved pathway eventually dumps cyclists off on Roslyn Avenue, a nice quiet side street. This may appear to be the end of the cycling pathways heading east. But if you know where to look, it is very easy to pick up another path which goes all the way to Trim Road. Head to the end of Roslyn Avenue (only a few short blocks) where you’ll come to the Saint-Louis Residence (a long-term care home). Here you will be forced to turn right. Soon after turning, keep an eye out on your left for the beginning of another pathway. 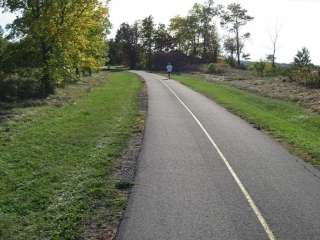 This path is approximately eight kilometres long and runs all the way to Trim Road. 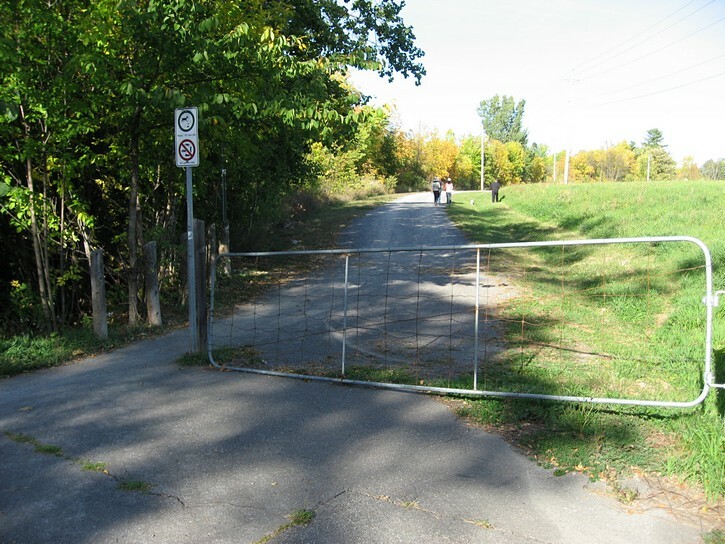 It is maintained by the City of Ottawa, so it doesn’t show up on the NCC cycling maps. It’s paved until Tenth Line Road, after which it is made with fine crushed stone. 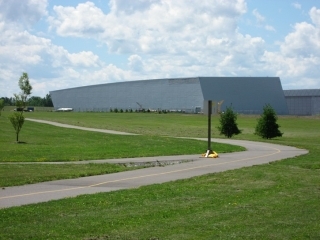 It runs through several open areas, but houses and other structures are often visible on the north side. The path has a number of easy to follow twists and turnsand is a pleasure to ride. At one point it runs along the southern edge of François Dupont Park. A little further it has a convenient exit point at the intersection of 10th Line Road and the North Service Road. 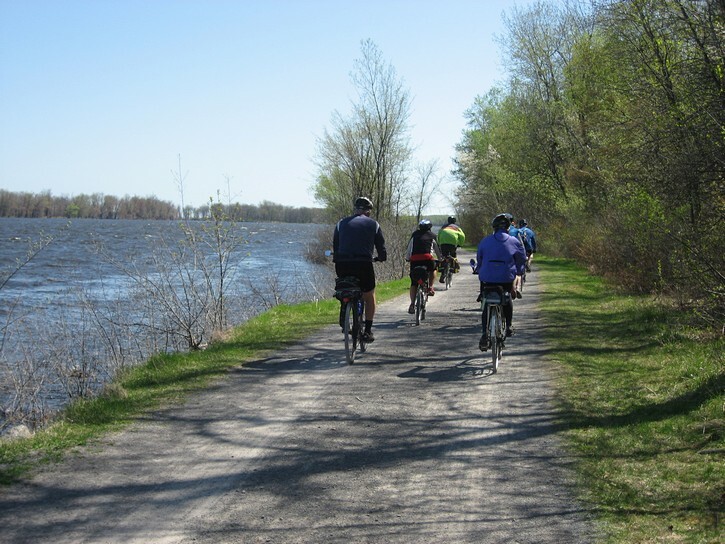 The crushed stone section between Tenth Line Road and Trim Road is suitable for bikes with narrow road tires. However, if you want to stay on pavement, you can exit at Tenth Line Road and head east on the North Service Road. This road parallels the path for the last few kilometres, is not too busy, and has a good paved shoulder. At Trim Road, cyclists have the option of turning left to go to Petrie Island for a for a picnic by the Ottawa River or to enjoy its magnificent beach. Unfortunately, this will put you on a coarse gravel road that can be quite dusty and busy on weekends. Although this half kilometre road is rideable (barely), it may not be ideal for all cyclists, or especially those on bikes with very narrow road tires. 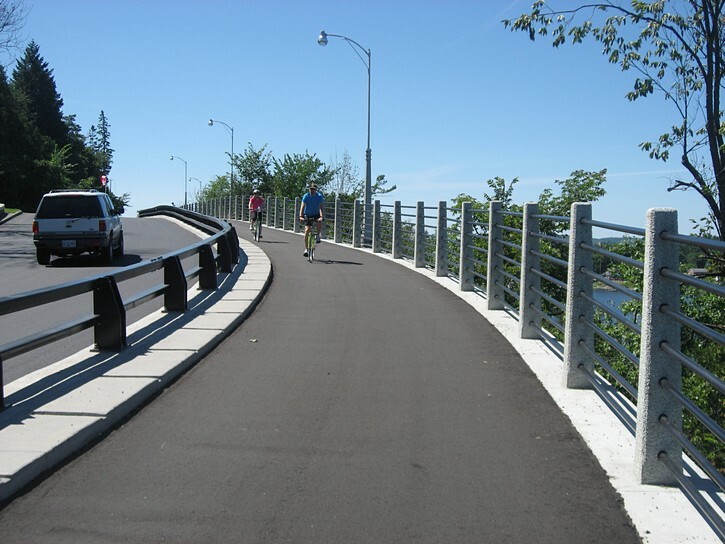 You can get on the fine crushed stone bicycle path where it parallels the North Service Road. 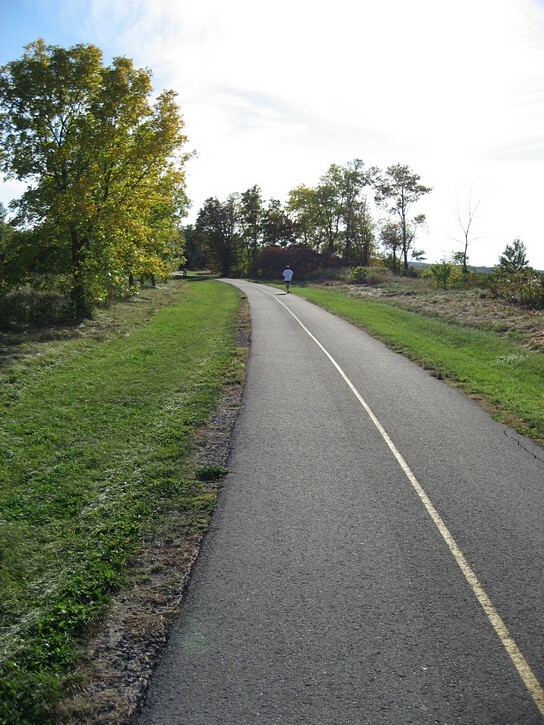 You can also pick it up the paved section of the path at Tenth Line Road or at a variety of other points a little further west. This pathway ends at Hiawatha Park Road where you’ll have to turn right. It soon curves to bring you on to Roslyn Avenue (a short distance). 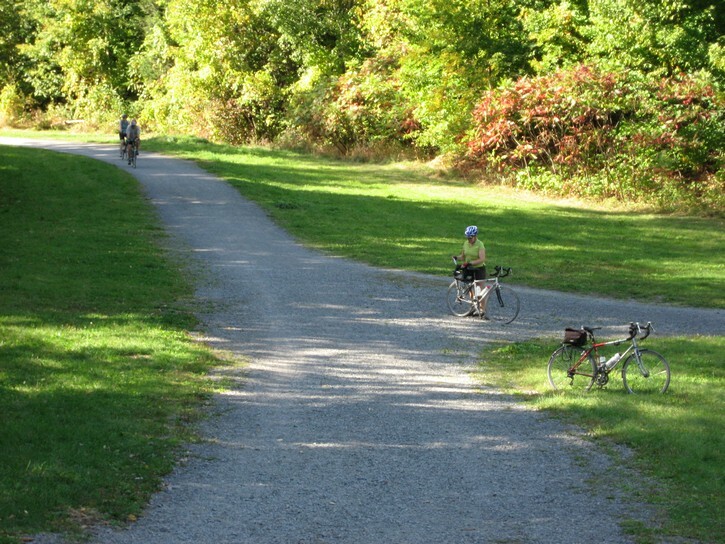 The paved NCC bicycle path begins at the end of Roslyn avenue. 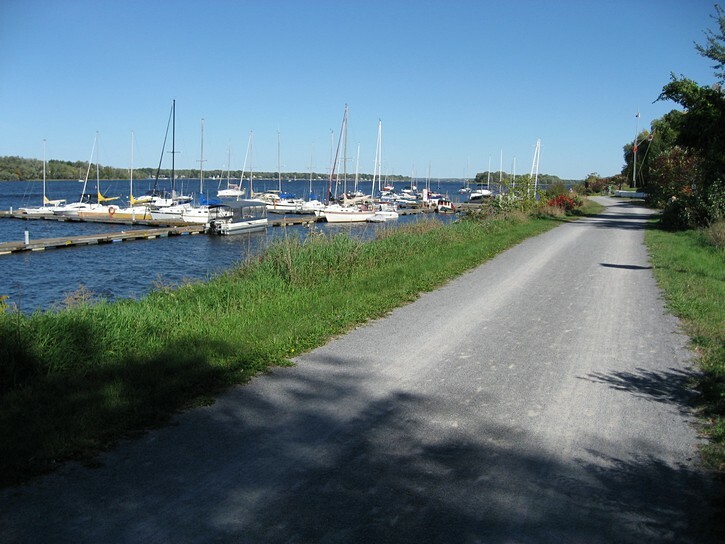 In a little over 4 kilometres, this paved pathway will automatically bring you to the crushed stone path which runs right next to the Ottawa River. 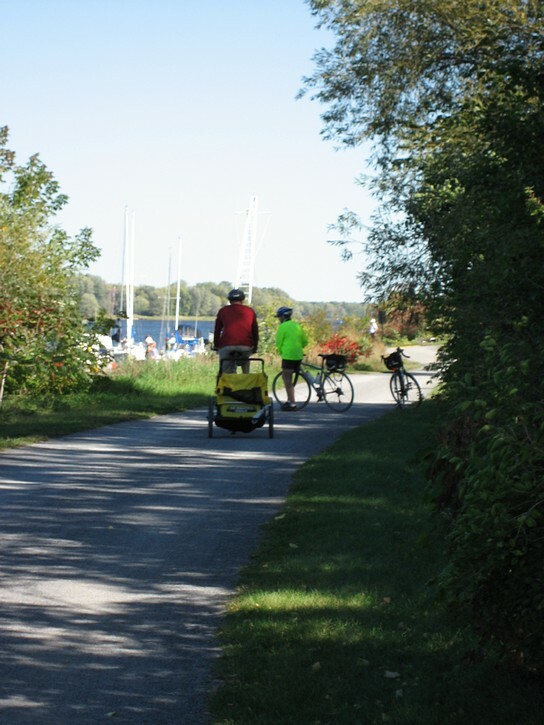 Once you pass the Rockcliffe Yacht Club (which you can’t miss), you have the option of turning left on any number of side trails to get to the paved pathway on the top of the hill. 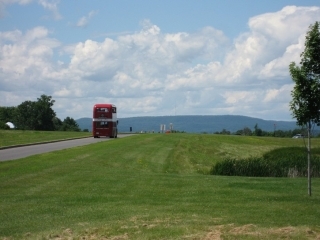 Once on the top of the hill, you can use the paved pathway to head further west. 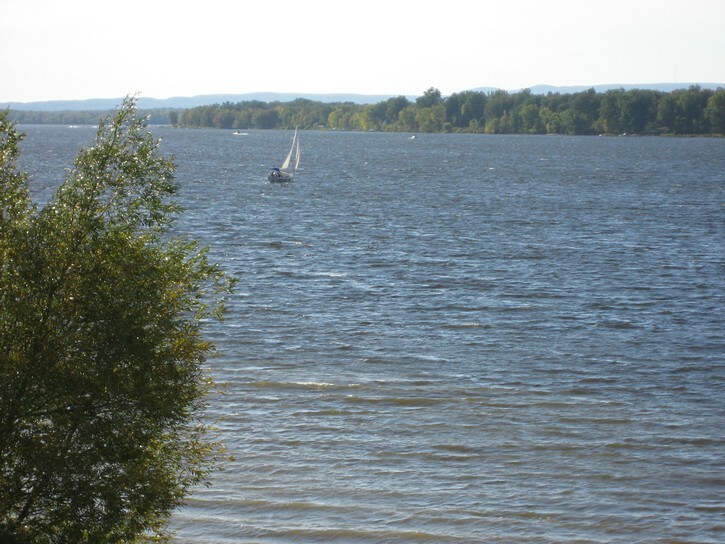 Eventually, this pathway will climb a fairly long hill, the top of which will provide you with an impressive view of the Ottawa River. 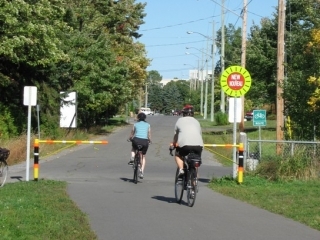 Shortly afterwards, there’s gap in pathway system where you’ll have to ride a few hundred metres on the George-Étienne Cartier Parkway. Fortunately, the paved bicycle path quickly resumes, but on the opposite side of the Parkway (on the south side of the road). Following this pathway will bring you to Sussex Drive. Parts of Sussex have a painted laneway reserved for cyclists. 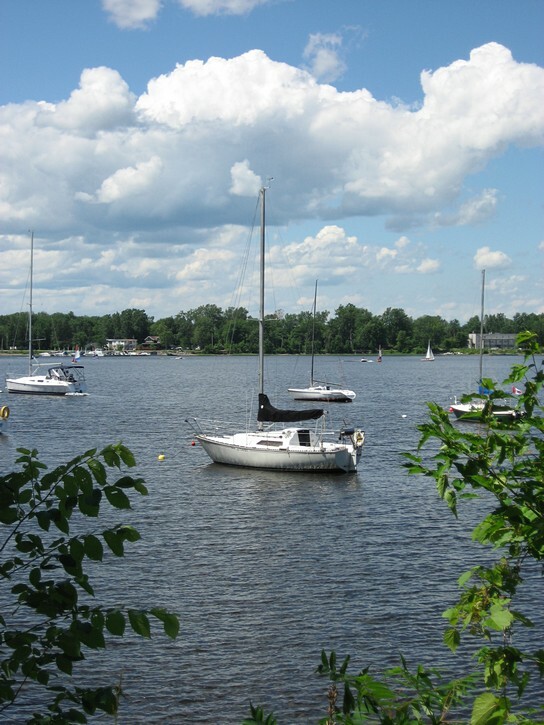 Sussex will bring you to the Market area in downtown Ottawa (about 25 kilometres from Trim Road). If you want to venture further west on the bicycles paths, you will have to stay on Sussex until you get in front of the National Art Gallery of Canada. Head towards the back of the museum by turning right onto Saint Patrick Street. Keep an eye out on the left side of Saint Patrick Street for an entrance to the path as soon as you get to rear of the museum. If you stay on Saint Patrick Street, you end up crossing the Ottawa River on the Alexandra Bridge. Once on the pathway behind the museum, you will descend a nice steep hill to the Rideau Canal. 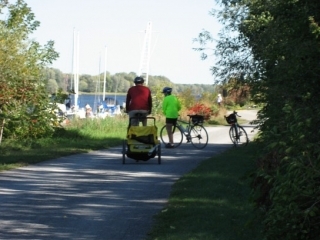 Walk your bike across the top of one of the lock gates to get to the other side of the canal. 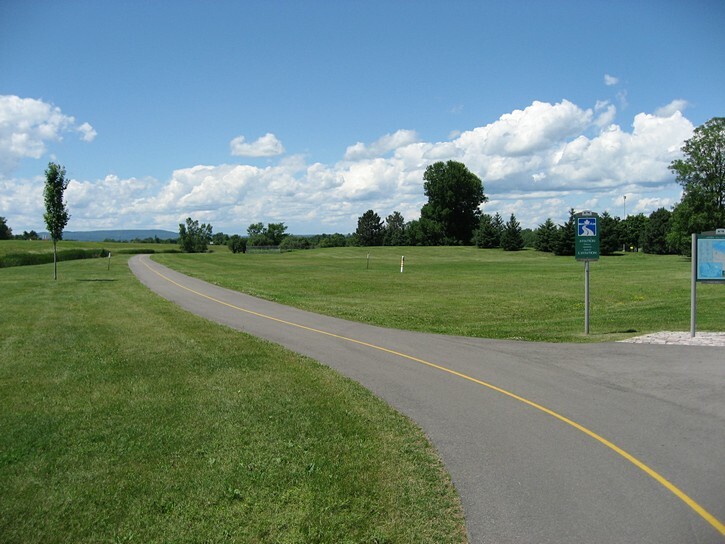 Now you’ll have the choice of turning right and following the bicycle path behind the Parliament Buildings (and if you desire, all the way to Kanata). 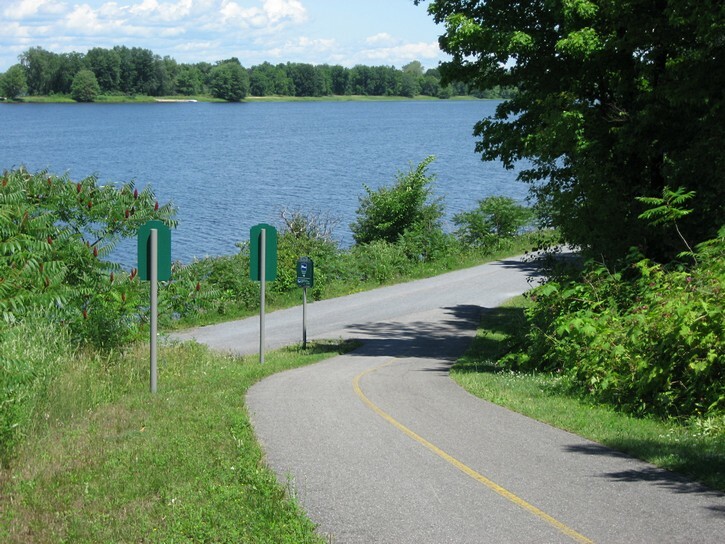 Turn left and you will be able to follow the pathway along the Rideau Canal to Dow’s Lake, and points beyond. You also have another option when on Saint Patrick Street behind the National Gallery of Canada. You could simply continue heading north on Saint Patrick Street and cross the Alexandra Bridge. It has a nice wide section for pedestrians and cyclists, and offers a great view of the Parliament Hill.